The year 2018 saw a number of new shows on TV. It was heartening to see that many of them had new themes and concepts. Producers are trying to veer away from the hackneyed saas-bahu dramas, which is a good sign. But as expected, not all experiments are implemented successfully or hit the right notes with the audiences. Here is a look at shows that disappointed in the first quarter of 2018. The show is inspired by the film Bawarchi. Jai Kanhaiya Lal Ki is a remake of the Bengali show Bhajo Govindo that aired on Star Jalsha. The makers had roped in Vishal Vashishtha for the main lead while actress Shweta Bhattacharya who was a part of the original played the lead here as well. Noted Bengali actor Dipankar Dey is also a part of the show. The serial was made by the original producers, Snehashish Chakraborty. Jai Kanhaiya Lal Ki has been shot in Kolkata. After Mehak which is been shot in Delhi, ‘Jai Kanhaiya Laal Ki ‘ will be the first show to be shot in the City Of Joy. We had expected a lot more from the show with the likes of Karan Johar, Rohit Shetty, Rithvik Dhanjani and Karan Wahi associated with it. However, the show was a dampener in all respects. The format is that of a talent show meets Bigg Boss 11. The sad part is that the contestants are not so entertaining nor exceptionally brilliant to keep us hooked. They had a few celeb guests at the start like Priyanka Chopra and Kangana Ranaut, which generated some interest but it is a damp squib thereafter. Actor Sarwar Ahuja and child actor Riva were part of this emotional tale. On the show, he plays a rick-shaw driver who tries hard to save his adopted daughter’s life. However, the show failed to strike a chord with the viewers. In fact, actress Aasiya Qazi was supposed to make an entry into the show but it wound up even before her episode could be aired. Now, buzz is that Discovery Jeet might be relaunched post the IPL in a grander manner. 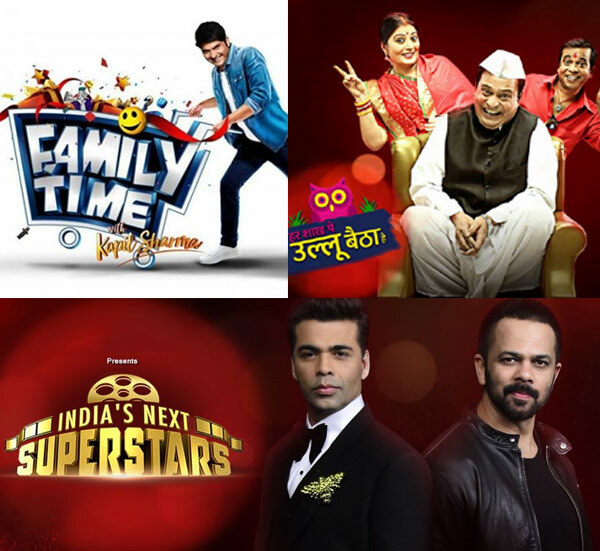 Star comedian Kapil Sharma made a comeback with Family Time with Kapil Sharma. The new show combines game show and comedy. The first episode failed to succeed in pleasing viewers with Twitterati complaining about the lack of comedy on the show. Kiku Sharda came as Bumper on the show while Chandan Prabhakar became a cold drink wala. The lack of originality was evident. The show really needs to inject more freshness to win viewers. We hope it picks up for Kapil Sharma’s sake. The show is an experiment for prime time television, so we have to give some credit to the makers. However, HSPUBH failed to connect like it was expected to. While Rajeev Nigam is in his element, the supporting cast needs to pick up. We really hope it does better!